So what's important with this song? Well, the little one likes to play this from my phone's music player over and over again. 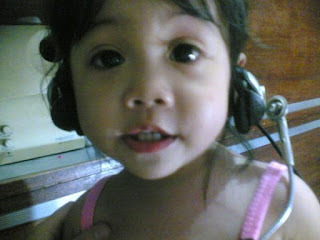 I just find it quite unusual since she's only 4 years old haha. The first thing she did this morning is to let me unlock my phone and play that song. She's been doing that for almost a week now. In fact, she memorized few lines already. That's why this curious mom asked her why she like the song, and then she said "It's Papa's favorite, eh!". It's not actually her Papa's favorite, but it is one of the few songs stored in my phone (which is previously my husband's, we swapped phones before he left for Qatar early this year).